In 1988 I made this print. It is a copper plate engraving, hand printed and water colored. The lines are cut by hand into copper using a burin which has a diamond shaped point. 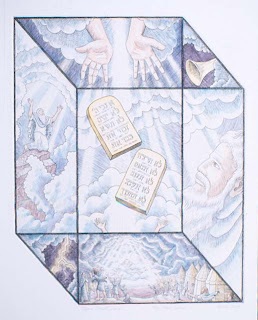 A Jewish friend showed me how to draw the Hebrew characters indicating the Ten Commandments. They are also written, not in the King James old English language but in the common everyday speech of The Book. "Thou Shalt Not Kill" translates to"Don't Kill". "Thou Shall Not Covet Thy Neighbor's Wife" translates to "Don't Be Envious Of Anything Your Neighbor Has". A child should be able understand them. The plate has been steel faced so that a large edition (400) can be printed. In intaglio printing the metal wears down so that the image begins to fade slightly each time it is printed. The electroplating slows this down.